Instant Summary: A pilot of a state-of-the-art mech lands on Earth, and gets picked up by a (seafaring) fleet with technology a few eons behinds. I know, it's already pretty late for such a post, but this is the last one. I sure saved the best for the last didn't I? Suisei no Gargantia pretty much secured the best title of the season with the first episode, and I'm disappointed to say that no other title in the season came close. 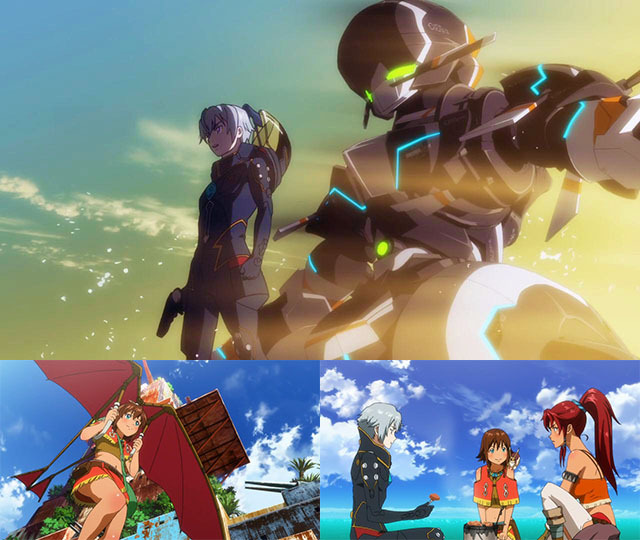 Personally, Gargantia has the best mech designs out of the 3 mech titles this season. It's much more detailed than Majestic Prince's, and not as messy as Valvrave's. The important thing is that while Gargantia's mech spent a lot of time on screen looking fabulous, Majestic Prince's mechs and the Valvrave spent a lot of time in the background, far shots, or blurry action scenes. The premises of this show didn't even need a flashy mech battle, but they did it as a prologue anyway, and made it look fantastic. The background is amazing. The beautiful clear skies and endless ocean created an amazing setting for the show. In fact, it's probably good enough to forget about the space battles altogether. It's also amazingly detailed, right down to the "primitive" tools of Gargantia, the rust from the salvage and the girls' outfits that suggests a unique heritage. And there's the character designs; it's a character designer's trick to use big, bright eyes to inject liveliness and youth into a character (think Eru Chitanda), and the effect here is multiplied by their contrasting dark skin; although they almost had a constant surprised look, you can really feel a lot of their energy, that which makes them really likable. Enough about animation! What sets this apart is that there's already quite a bit of development in the characters and their relationships, as they're bridging the disparity between the two groups in terms of culture and technology. I love seeing how they're already warming up to one other, from the beginning where they held each other at gunpoint. The relationship between the bubbly Amy and stony Ledo is a rom-com in the making! And of course, there's also the bits of comedy gold. Damn primitives and their animal corpse-eating habits! And finally, there's also the action, which can be exciting without being explosive. That's saying a lot when there has only been a few battles so far. Having your protagonist hold a overwhelming combat advantage can be pretty cool. This is probably way too long for a first impression, but this very well shows how impressed I am with Gargantia. Outlook: Already secured the best title of the season.